Tokamachi is a small city situated in the southern region of Niigata prefecture, right in the heartland of Japan’s Snow Country. Every winter, snowfall accumulates to average depths of two to three meters, casting a blanket of white over the entire region. 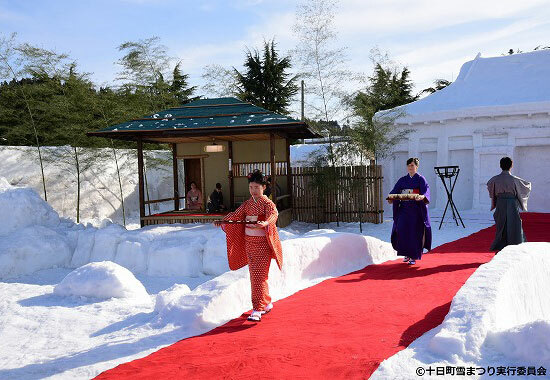 These extreme conditions create both hardships and blessings for Tokamachi: all of which are showcased in the breathtaking Tokamachi Snow Festival, held annually in mid-February. In the weeks leading up to the festival, the local residents come together to sculpt the snow into the shapes of popular anime characters and cultural symbols at sites all over town. Guests are also warmly greeted with a variety of local-style street food stalls, games and events. 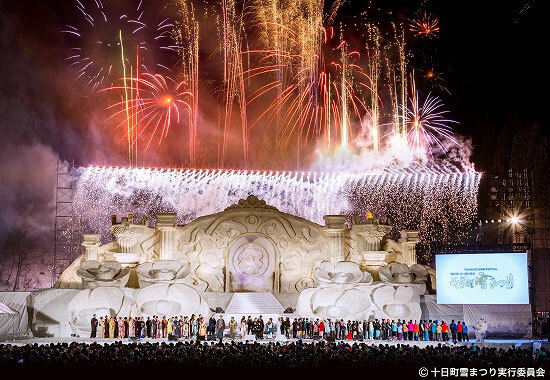 Don’t miss the “Snow Carnival,” the enchanting climax to the festival which features live music from popular artists, a kimono fashion showcase, and a vibrant fireworks display – all unfolding upon a gigantic stage artistically crafted from the snow.